An empty email inbox is the Holy Grail of today’s creative class. My inbox piles up during the semester in the fall and spring, and receives a thorough purge every Summer and Winter break. However, each year I get closer and closer to maintaining cleanliness throughout the week (without investing hours of time). Here’s what I’ve learned. 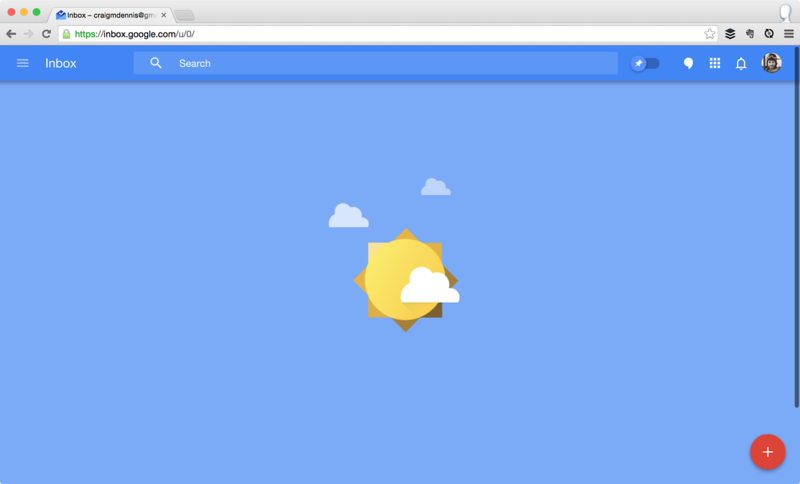 When Alphabet (formerly Google) rolled out the generically named “Inbox” app, I became an early adopter. I didn’t like it at first. How can you improve on Gmail? Inbox has some wonky features and very simple, cartoony graphics. However, over the last year, I’ve come to appreciate its simplicity and power. I’ll return to some of its native features below. 2. Forward all emails to one address. 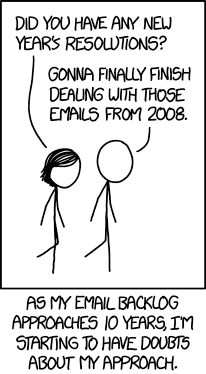 It’s easy to give out your email these days. I subscribe to things almost without thinking: new apps, Kickstarter projects, newsletters, politicians, blogs, Google alerts, paperless bank statements etc. etc. ad nauseum. When I’m checking my email, I hate all these emails. The fact is, when I click “subscribe” I’m not thinking about that. Google Inbox makes it fairly easy to unsubscribe (or if need be, just “filter” messages from that sender.) And recent mailing list tech has improved on that front. So first, go to every single email that no longer sounds interesting to you and scroll to the bottom to find the little “unsubscribe” button in light gray font. And secondly, if you can, remember not to subscribe to so many things. My wife literally paid me to help clean up her email inbox, and I unsubscribed from 40 senders before I became exhausted and had to take a break. 4. Pack out your “low priority” bundle. Creating bundles takes time. Some are native and some must be created by you. Google Inbox natively understands when emails are sent from your bank, ecommerce site, insurance, investment group, etc. and bundles them under “finance.” Google Inbox is also natively pretty dumb about these bundles. It needs coaching. I separate out, for instance, bank statements (monthly summaries which I almost never read) from bank notifications (low balance, new deposit, that I do read). Eventually, it does this for me. After you get the hang of their basic bundles, you can create a few of your own. I don’t recommend going overboard here. I have 5 custom bundles. Instead, use the “Low Priority” bundle. “Low Priority” is Inbox’s version of the binary “important” and “not important” distinction that Google invented in the later iterations of Gmail. Use it. Pack it out. This is the key: bundle everything that you don’t need to read but don’t want to unsubscribe to in “Low Priority”. It’s a godsend. About once a week or twice a month, I click “Low Priority”, scan the items for about 10 seconds, and click “done”. They’re gone! Archived forever. Over time, all new messages will be filtered out for you into individual emails (all important messages) or massive bundles 30-50 email large that you can glance at and destroy in one click. Your quick daily or thrice-daily email check should consist of a scan of new messages. Reply quickly to what you can, archive what you can, then “pin” those that require further thought or tasks before you log out. 6. Respond, archive, pin, repeat. Once Google Inbox learns your bundles and does some of the heavy lifting for you, then you only need to maintain. About once a week (or in my case, twice a year!) you can return to your pinned items. You can view only blue pinned items by clicking the little blue toggle at the top. Complete the tasks needed, and click “done”. If the “Low Priority” bundle has already been cleared, and all other messages responded to… well, you just might have a clear Inbox… for 12 hours at least! Let me know your flow – or if you’re trying this, let me know how it goes!